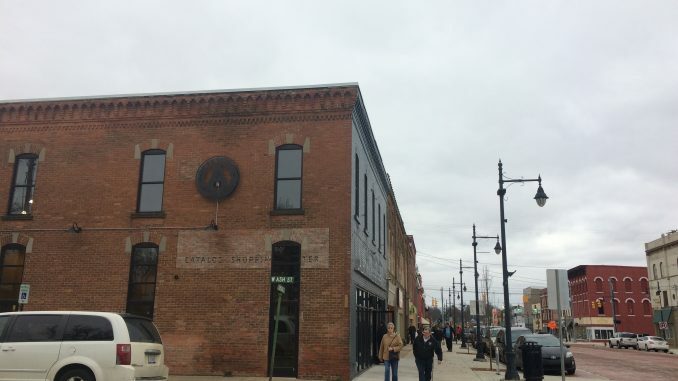 Albion’s downtown was bustling as community members toured soon-to-be open businesses and residences at the Open House event, hosted by ACE Investment Properties. Albion Malleable Brewery, the Peabody Apartments, Pure Albion, Brick Street Marketing, The Office and the Foundry Bakehouse and Deli were all open to tour or try samples. All spaces but Albion Malleable Brewery are owned by ACE. Students were happy to see events like this bringing the community together, particularly Rebecca Rizer, a junior from Chesterton, Indiana, who happened to be working April 17. Andrew Dobbins, a General Manager for Caster Concepts, said he is excited to see downtown Albion become revitalized as a place where you can walk down the block and stop into many stores along the way. Pure Albion and The Office are right next to Brick Street Marketing between Ash Street and Elm Street along South Superior Street. Pure Albion will sell a variety of things made by local community members. For the tour, the store already had jars of honey, jewelry, shirts and bags with the clothing being themed around Albion. Inventory will rotate as different local goods are provided. Part of the shop’s set-up is meant to pay homage to the city’s history. The long wooden sales counter is from the now closed Albion Home Laundry. It traveled to Concord and was used in the V and S Variety Shop during the 1990s, but has now returned to be used in Albion. If you wander past the Pure Albion half of the store, you enter The Office’s space in the back. This area provides large meeting tables as well as individual desk spaces. Their goal is to provide a space for people looking to start a business who don’t have a place to run it and for people passing through Albion who need a space to get work done. Desk space can be rented out for a variety of membership rates. These spaces are well-lit, displaying fresh paint and wood flooring that flows consistently throughout all of the areas. All three spaces are expected to open within the next month. The Foundry Bakery and Peabody Apartments are not expected to open until August this year. When walking through the Brewery it is easy to see the amount of work that has gone into the building. It has the charm of an old brick charm still, but with new appliances and decor. Over 40 residents packed the space during my time touring. Long wooden tables invited Open House visitors to sit when not touring the brew room. The three large drums were lit up and running behind a pane of glass separating the brew room from the bar. The Open House event was meant to be a celebration of things to come for Albion and a positive sign for its revitalization.